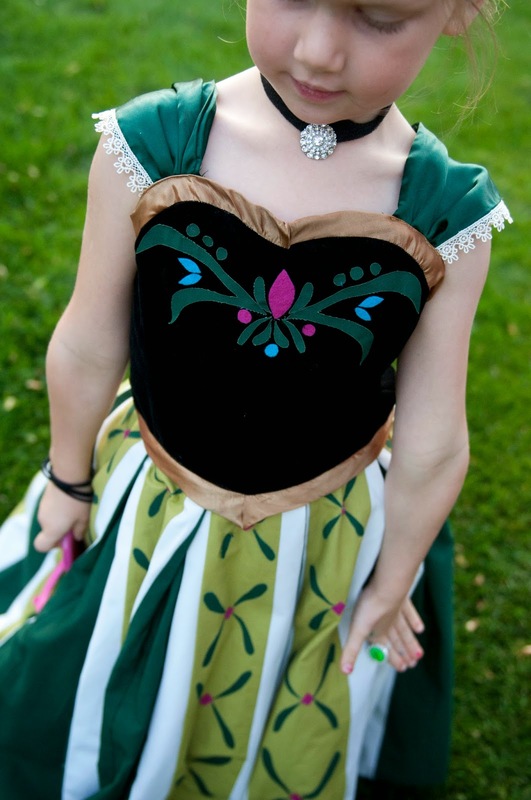 Very Homemade: Anna's Coronation Dress with How To. Anna's Coronation Dress with How To. I'll run through a quick and dirty how to. If you have questions let me know. This is roughly how I tackled creating this dress. 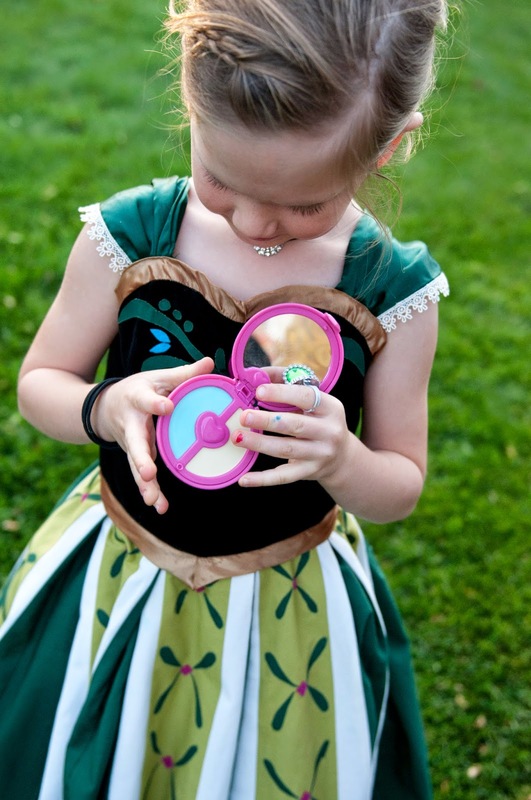 I opted to use fabric with wonder-under on it for all the designs on the bodice and skirt. It took SO. MUCH. TIME. to draw and cut out. But, I don't have an embroiderer, and I was afraid of using paint, so wonder-under it was. I suggest getting the strongest wonder-under available. There are a few pieces that have come off of my daughters dress. It's not a big deal, I just have to cut and iron on a new piece, but you can avoid that by using a strong wonder-under. Let's start with the bodice shall we? I drafted the pattern using one of my daughters well fitting dresses as a guide. It is fully lined, as I can't stand unfinished edges. : ) The bodice is simply a sleeveless heart shaped top with some added sleeves. For the bodice, I used 1/2 a yard of black cotton velveteen found here. For the gold trim, I made some bias tape from a greenish-gold taffeta found at Joann's. Looking back, I would have done something different for the trim, perhaps some pretty gold ribbon instead. The taffeta was difficult to work with around the rounded front and I wasn't able to get it as smooth as I would have liked. For the back closure, I opted to use buttons. The sleeves I made with a green satin and white lace. I simply cut a rectangle out of the green satin, hemmed one side, and added lace to the other, then I gathered the rectangle where it would attach to the bodice, and sewed it on. 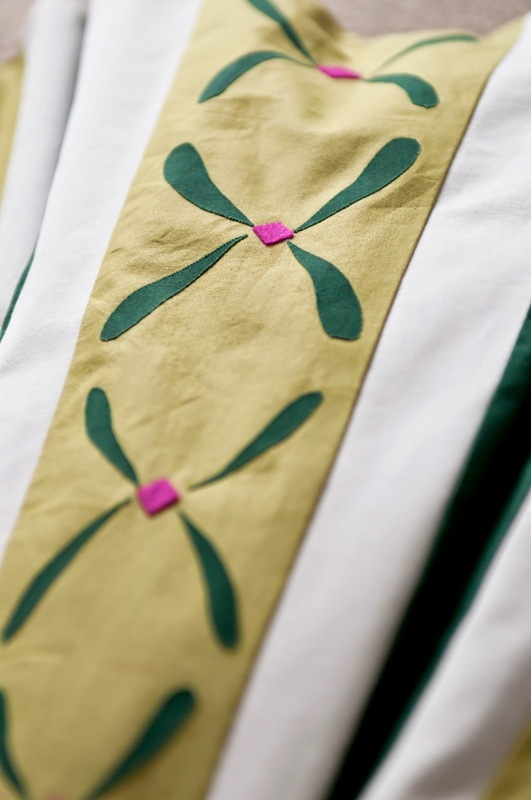 The design, as mentioned above was cut out of fabric backed with wonder-under. It was time intensive, but it turned out pretty well. Next up is the skirt. Cupcake Cosplay has a quick snippet of how she constructed the skirt. It was so very helpful. The skirt is a box pleated. It appears to be A-line when stationary, but with the added panels of the box pleating, the skirt is really shaped like circle skirt. 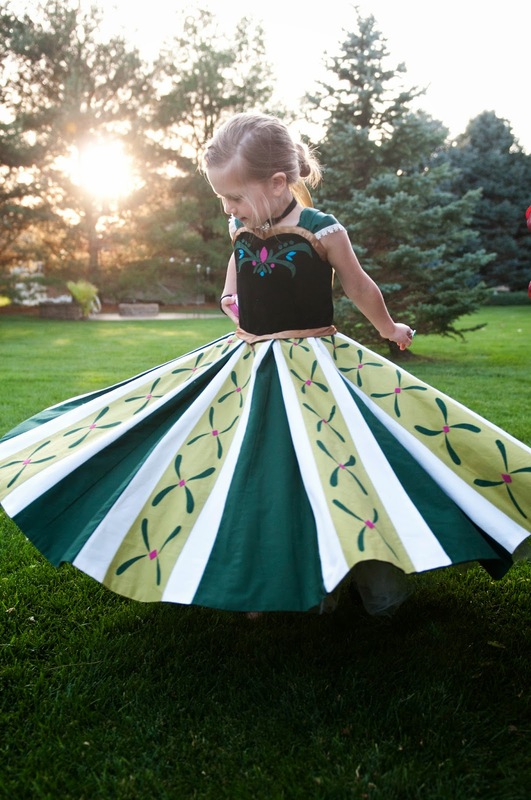 You can see that it is a circle skirt when my daughter twirls. I purchased 2 yards of Robert Kauffman kona cotton olive green fabric found here and 1.5 yards white Kona Cotton. For the hunter green fabric, I used a stiff rodeo fabric to give the skirt a bit more body. Constructing the skirt was my favorite part. I took my daughters waist measurement and decided that I wanted 8 panels of the olive green and white. So I took my daughters waist measurement and divided by 8. This should be the finished the width of the top of each panel. I then cut out what will become the three sections of each panel, and traced it onto another piece of drafting paper with added 1/2'' seam allowances. Clear as mud, right? Email me with questions. Then I could cut out my fabric. I needed 8 of the olive green middle section and 16 of the white side sections. 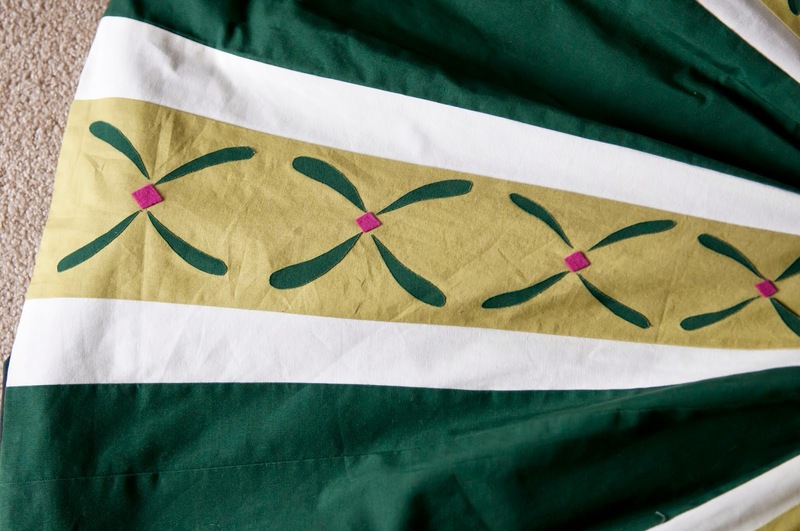 I then sewed all the white side sections to the green sections creating 8 panels that look like the above rendering. Next we will cut out the hunter green panels using the same pattern pieces. You will need 8 total hunter green panels, each panel is divided into three pieces just as you did before. I then sewed the 8 hunter green middle pieces to the 16 hunter green side pieces to create the 8 hunter green panels. Now it is time to sew the hunter green panels to the green and white panels. When you are all done, you should have something that is close to a circle skirt. I did not want to have any hem showing on the skirt, so I created a lining for the skirt that would both hem the skirt and add some weight to the skirt. I used a black sheet and traced and cut out a lining that was the same shape and size as the pieced skirt. I then pinned the black sheet to the bottom of the pieced skirt with right sides together and sewed along the bottom edge. I then turned the fabric right side out and iron the lining up. Holy WOW. This is AMAZING. You did such a wonderful job. This dress is my favorite too in the movie. 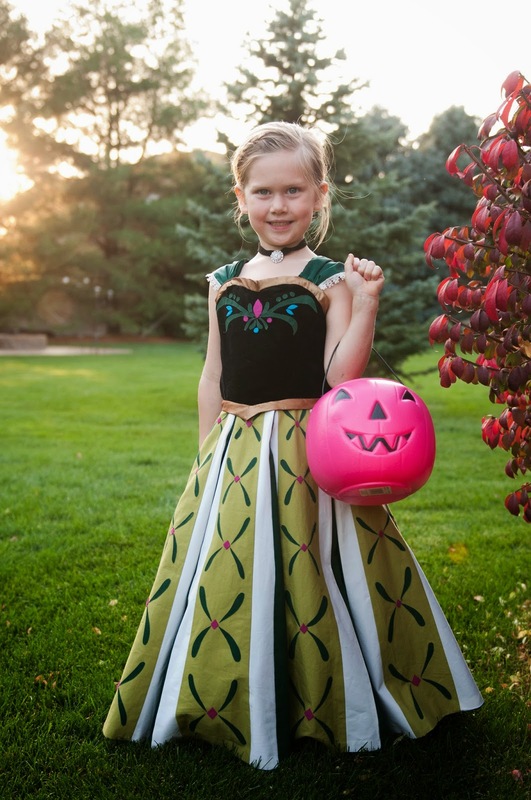 My girls love Elsa, but I totally think Anna's clothing is better! We're in the same boat in the anna vs Elsa wardrobe debate. : ) thanks for your kind comments! Made my day. Unbelievable! She is such a lucky little girl! 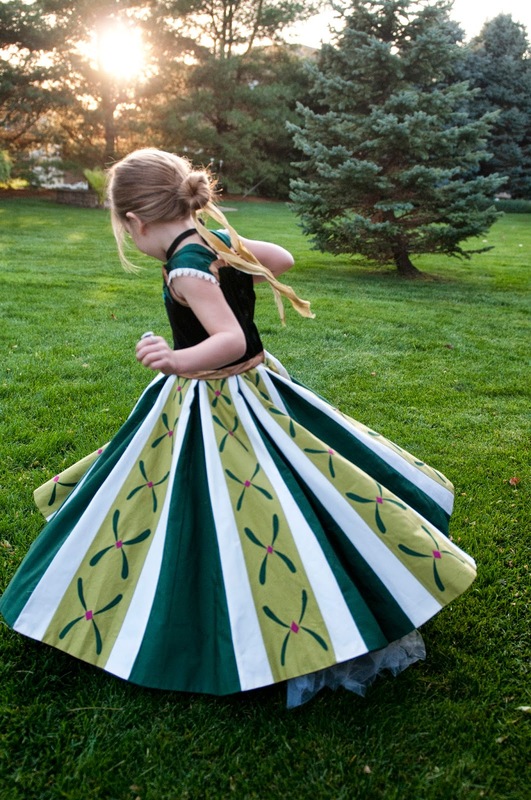 That is the most charming Anna dress that I have ever seen on the internet or in stores. My granddaughter has the Disney dress and it sheds glitter everywhere. I thought about making her a new dress, but you must have spent hours on your dress. I can just picture you pulling off the white paper backing on each of those small pieces and ironing them to the fabric piece! Great job. I have just stumbled on this, and it's given me hope that I will be able to make one for myself!!! 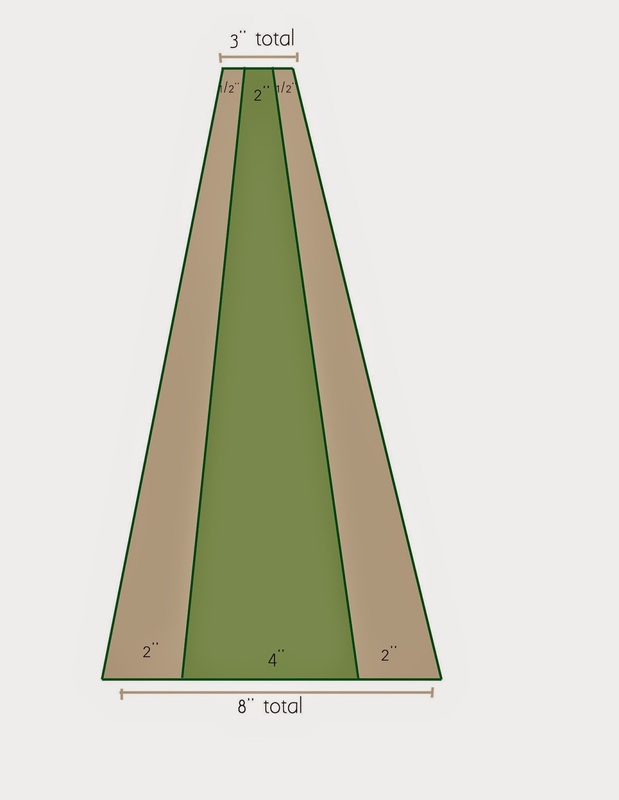 I'm hoping to use your trapezoid pattern and adjust the size! I have a couple of questions! - the green panels that are 'at the back' of the pleats do you think it's very important to cut and sew these back together as such? Hi, Hanna! I'm assuming your asking about the hunter green panels inside the pleats. You certainly don't have to piece those together as I did. I did it so that the pleats would have a natural place to crease when making the pleats. Because they are pieced, I don't have to continuously iron the fabric inside the pleats and it worked beautifully. If you don't piece those panels together, be sure to press them very well when making the pleats. let me know how it goes! I am intrigued at how you approached the skirt, I always saw the main part of the skirt as the dark green part in your dress and the decoration and an accessory of sorts,so as I was reading your tutorial I was confused until I realized that you were doing it "backwards." lol It is amazing how two dressmakers see a skirt or dress and their approach to construction. I have been on a casual search for fabric to make myself an "anna" inspired skirt for everyday wear, now that I am not reading your tutorial backwards anymore I have some new ways to approach the look. Thank you. Isn't that the beauty of dress making? Almost like math, you can find various ways to get the same answer! The hunter green panels for this version is hidden when standing still, and only shows when she moves and walks so I considered the decorative light green and white panels that always "show" the main part. Happy sewing!